“Gunmen kidnapped a 28-year-old woman who was the sole police officer in the town of Guadalupe, close to the violent northern border city of Ciudad Juarez, state officials said. 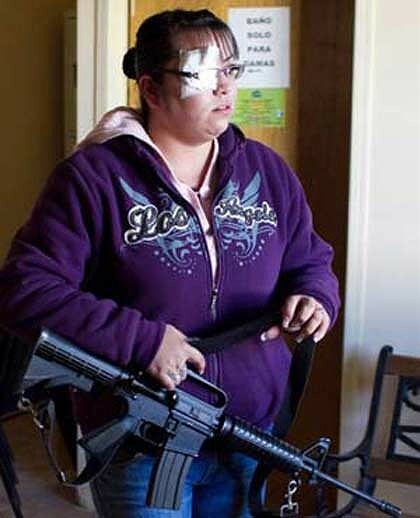 “Some ten unidentified gunmen on Thursday set Erika Gandara’s home ablaze and torched two cars parked outside before abducting her, witnesses told the state of Chihuahua prosecutor’s office. No one knows how many residents have left the city of 1.4 million since a turf battle over border drug corridors unleashed an unprecedented wave of cartel murders and mayhem. Business leaders, citing government tax information, say the exodus could number 110,000, while a municipal group and local university say it’s closer to 230,000 and estimates by social organizations are even higher. “The 12 gauge shotgun is the most devastating and lethal weapon yet devised for inflicting rack and ruin at close range. A safe bet for ammunition selection is to use the 2-3/4-inch 00 buckshot load. The impact of one of these shot shells is essentially equivalent to getting hit with a nine round burst from a submachine gun. “Going by various nicknames such as : “street sweeper” and “riot gun”, the 12 gauge shotgun, using buckshot, has a well-earned reputation for effectiveness during close-range shooting events. Good pump action shotguns from Mossberg, Remington and others may be purchased for no more than $300 – about a third of the asking price of the AR-15 and similar rifles and having a terminal effectiveness far out of proportion to the price of the gun itself. Message to the UK: Quick! Ban all crossbows – and knives – and sticks…and stones, too. The UK has banned or made nearly impossible to own just about any kind of firearm, supposedly on the grounds that firearms make citizens less safe. 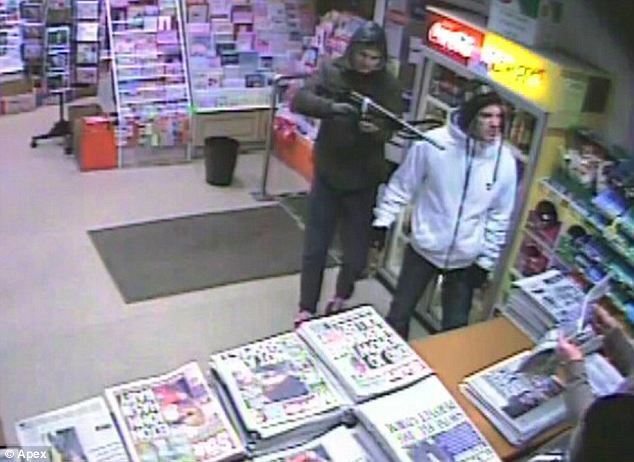 Well, those wacky and resourceful UK Bandits have found a way around not having firearms—now they’re using crossbows and knives. Obviously, those need to be outlawed as well. Next, anything hard that could be used to club or poke someone will need to be outlawed. Eventually marshmallows will be outlawed, since they can be used offensively as effective suffocation weapons. Given their track record, I don’t give them very good odds on figuring this out. They’ll probably be banning marshmallows and plastic wiffle ball bats first. Snarling and brandishing a crossbow, two thugs burst into a post office and thrust the weapon in the face of a terrified sub-postmaster. They were so brazen they didn’t even bother to wear masks, their faces contorted with aggression and captured clearly on CCTV. This guy was once a jet pilot in the military. The first part of his presentation is an interesting overview of some serious trouble brewing in the Muslim world that could have a profound affect on the US and other countries all around the planet (the second part of this presentation is clearly a sales pitch for a set of financial products, we make no recommendation; don’t know if this group is any good or not – we have no financial ties with them). This week we learned about an amazing new Navy (and NASA) electromagnetic launch system that moves a jet 240mph across a 300 foot runway. What we didn’t know is this ulta-advanced technology was developed by Disney. As in Mickey Mouse. The Navy’s Electromagnetic Aircraft Launch System (EMALS) is designed to use electromagnetic energy to propel a 100,000 lb. jet 240mph across a 300 ft. runway. According to the Navy, not only is EMALS a smaller and more efficient method of launching planes than steam turbines, it can deliver 30% more power. The Navy says they will to use this system to launch all aircraft from carriers going forward, including heavy strike fighters and lightweight drones. The technology was first developed not in a secret lab in Area 51, but in Florida for the Rock n’ Roller Coaster (photograph above) found at Disney’s Hollywood Studios in Orlando, Florida — and designed jointly by Disney’s Imagineers (what Disney Co. calls their engineers) and Vekoma, a company that builds high-end amusement rides. This administration seems determined to make sure there is another catastrophic attack, by persecuting people who point out the absurdity of the current security measures and by not admitting to themselves that most of the violence directed at the United States comes from Islamic death-worshipers.